This blended mop heads is well suited for every janitorial operation wet mopping used by commercial professionals and cleaners who require long lasting mops for heavy jobs (malls, hotels, factories, offices, schools, hospitals, building service, contractors, etc.) As well for everyday washing, maintenance, scrubbing, disinfecting, soaking up spills, etc. The mop head absorbency is related to the size of the mop head (not directly related to its material). Choose a size that will be manageable for you, matched to the size of the floor to be cleaned, (A mop with a lot of material, will be heavy when it is full of water). 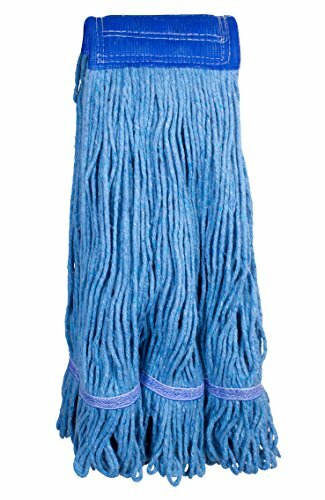 Extra-Large mop heads hold 32 - 40 oz. of liquid. The Color allows you to organize cleaning equipment by assigning different colors for different tasks. The standard blue color coding is: All-purpose cleaning, including dusting, window cleaning, and offices. Durable synthetic mesh saddle headband provides nonabrasive scrubbing to help dislodge dirt and to allow quick drying of yarns, and great durability. 5-inch. Wide universal headband fits both popular mop handle Heads stirrup side-loading, and jaws clamp-style, (handle sold separately). 4-ply loose twists yarn, made from cotton rayon and synthetic blend fibers, provides the ideal balance of performance, price, and appearance, by combining the advantages of several different fibers, high strength, excellent water absorption & retention, for effective floor drying. Afford maximum water pickup and require no ''break in'' period, give increased strength and long product life. Mop head has both, tail-band and looped-ends, to reduce tangling and fraying, holds the individual yarn in place, will not lint or leave gaps, increases a wider and more even spread, can cover twice the area in less time per each pass. Last up to 8 times longer than mops with cut ends. Can be laundered many times, for longer product life and cleaner appearance. This X-Large mop head holds 32 oz. of liquid. Well suited for every janitorial operation wet mopping for general commercial (malls, hotels, factories, offices, schools, etc. ), as well for everyday maintenance, washing, scrubbing, soaking up spills quickly, and with less effort. Suggested to be used with a commercial wringer mop bucket, the standard blue color coding is for all-purpose cleaning, including dusting, window cleaning, and offices.